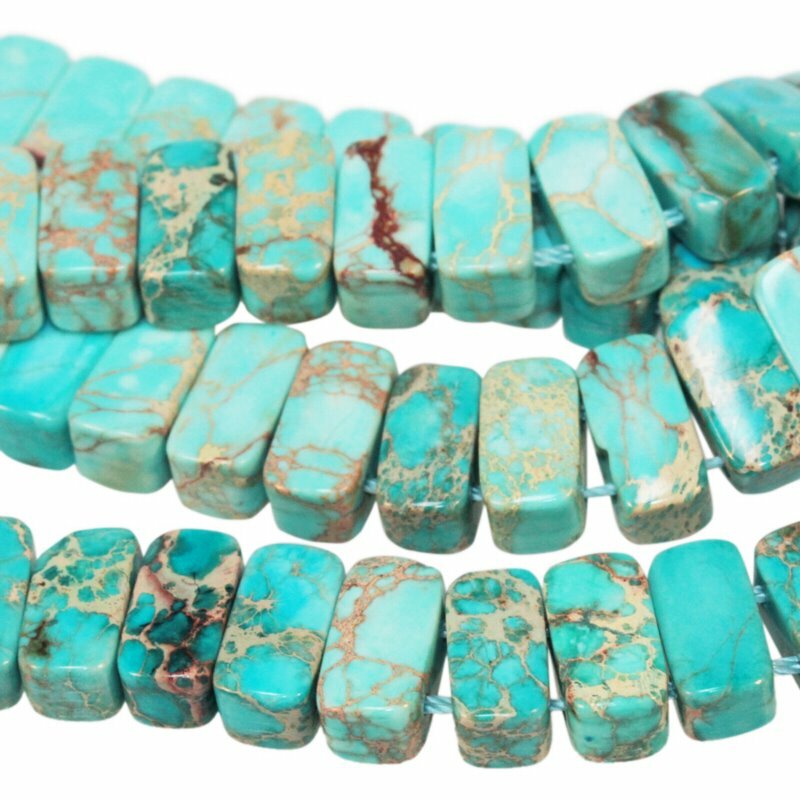 Home BeadFX Weekly World News Aqua Impression Jasper and a Revolution in Applying Glue! Aqua Impression Jasper and a Revolution in Applying Glue! 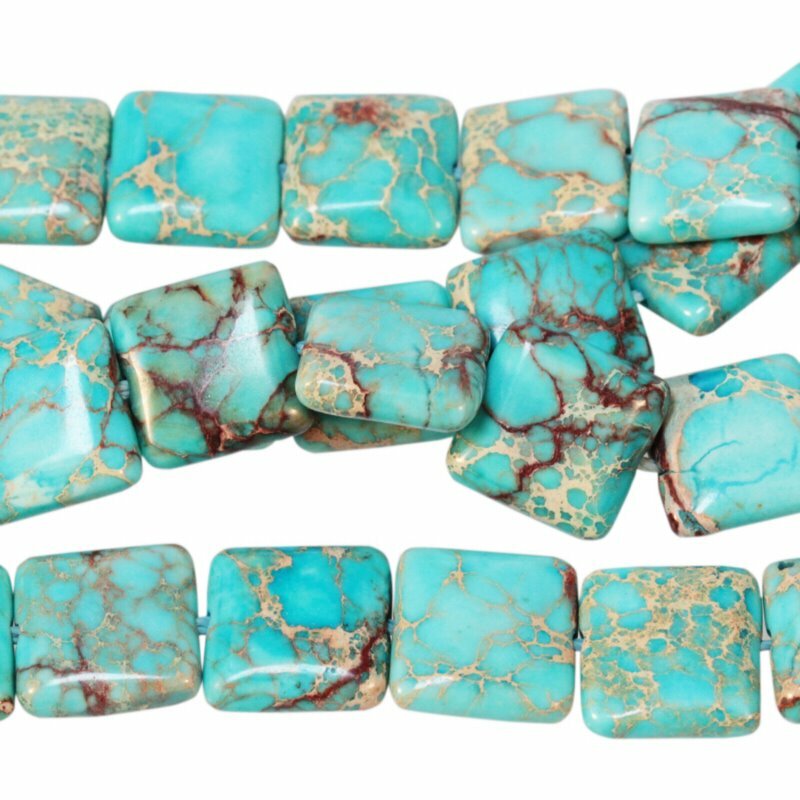 I can’t decide which of these I’m more excited about – the new Aqua Impression Jasper – which is just soooo pretty – or the utterly fascinating Glue Looper! 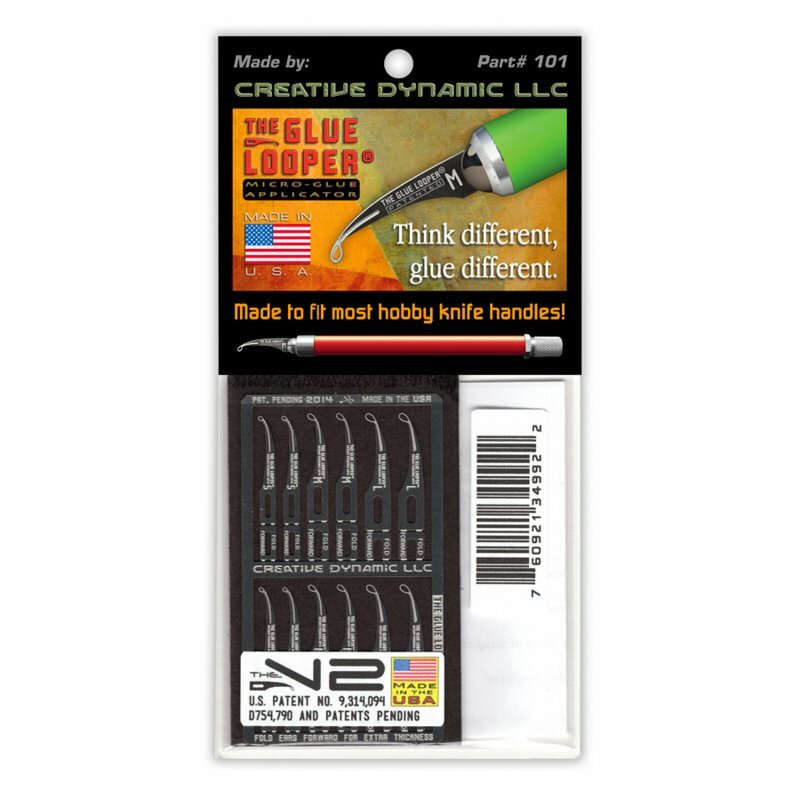 The Glue Looper is a revolutionary way to apply glue and adhesives. I’ve never seen anything like it. It first came to my attention with a video in an email from one of the beading magazines – with some handheld video from one of the bead shows – showing a demo of using it. I was gob-smacked. I encourage you to watch that video first. Now – if you watch this video – from the manufacturer – it shows assembling a model of a tank, or something, and you might be thinking – ok – Dwyn has seriously lost it now – Bead the Raven was crazy enough – but at least marginally on topic – this is just plain whack. But – I want you ponder this for a second. What do you do in your crafty life that involves putting a sticky liquid somewhere with a great deal of precision? Gluing rhinestones perhaps? What else? Tiny dots of resin? Will it work with paint? Or nail polish? What about the rest of your non-crafty life? Surely there is stuff that you need to glue? What designs could you make if you could apply glue to be invisible? I don’t have all those answers yet, but I am reeling with possibilities. 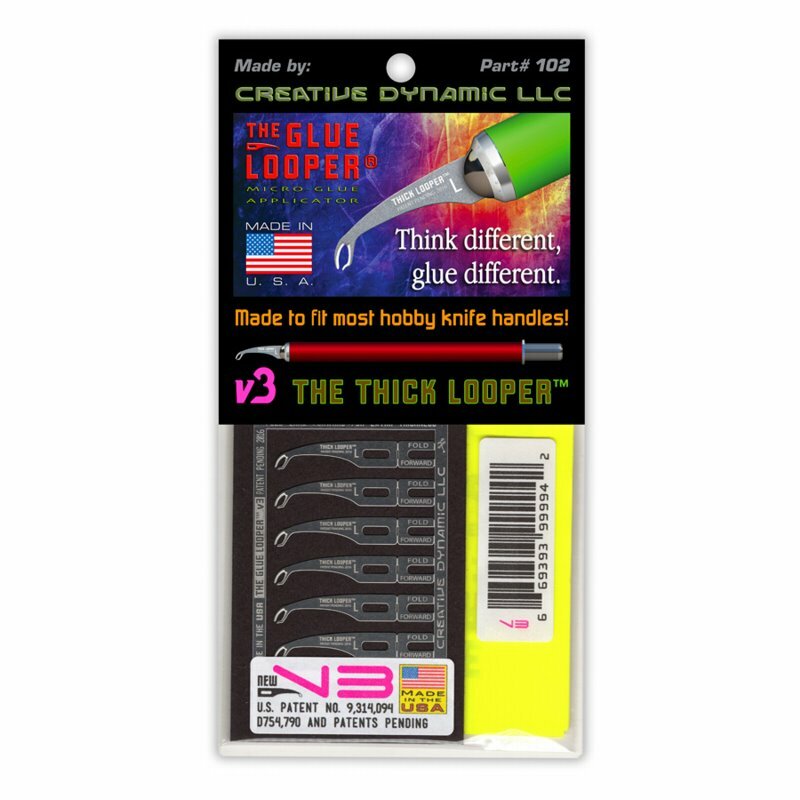 In a nutshell – the glue looper is a tiny blade with a loop, that you use to put small amounts of thin glue (like crazy glue) to exactly where you want it, without dripping or mess. There is a version for thicker glues too, like epoxy or craft glue. Sorry – the E6000 and paste thick glues won’t work. V2 – Three sizes within this version – small, medium, large. Start here. 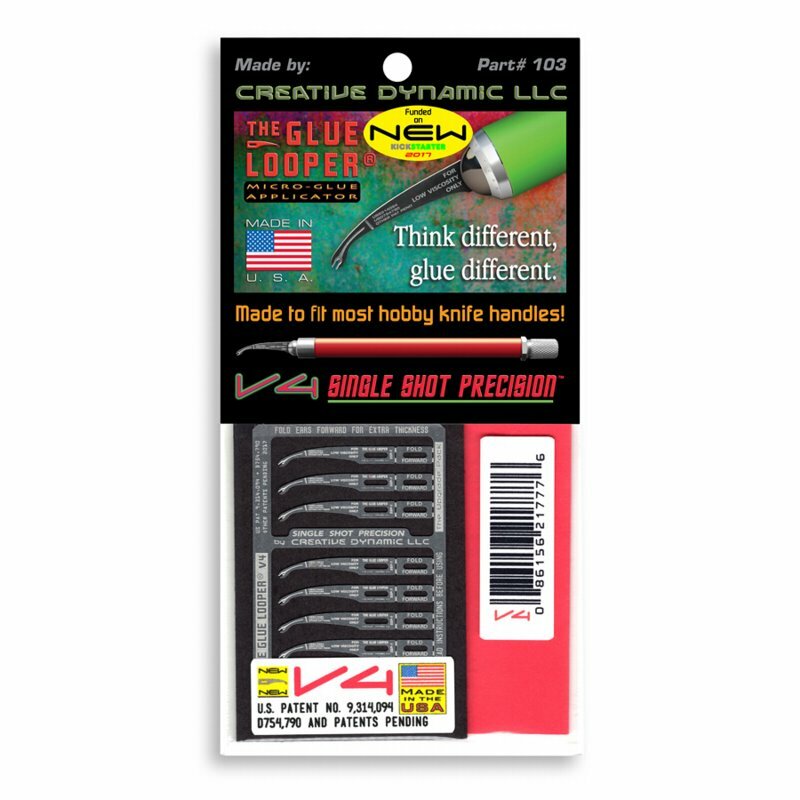 V4 – for extremely tiny applications – thin glues only. I’ve been experimenting with it myself, and I have to say – it is like a magic wand that makes things stick together. I used it to repair some broken stone pendants – and I’m applying the glue, thinking “this isn’t going to work” – and boy howdy – it did. It’s like they were never broken – you can hardly see the crack. Can’t make it to the Marti Brown classes on anodizing Niobium with a rainbow of colours? 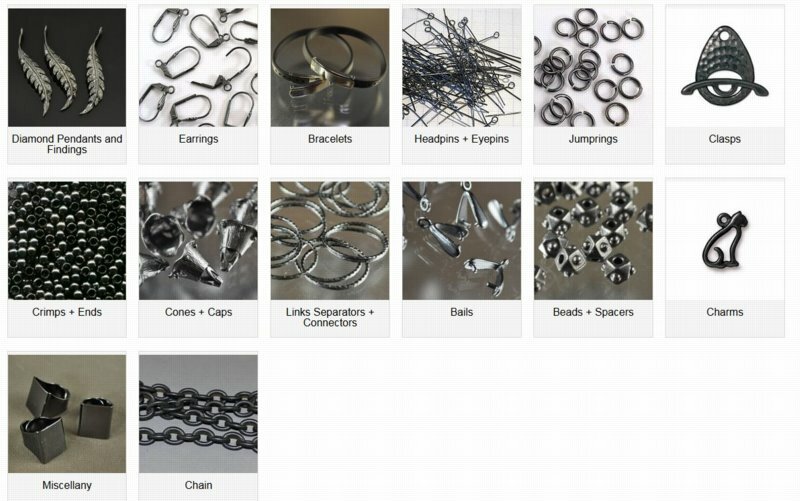 – we do have the anodizers for sale – and we will be stocking the niobium wire too. We’re just letting the students in this weekend’s class get first crack at it. Of course – there is a couple of spaces left, so you could sign up and get first crack at it too. Speaking of signing up for classes – calling all lampworkers! Spaces are still available in the fabulous class with Joy Munshower! Sign up before Oct 10 to get the early bird pricing. 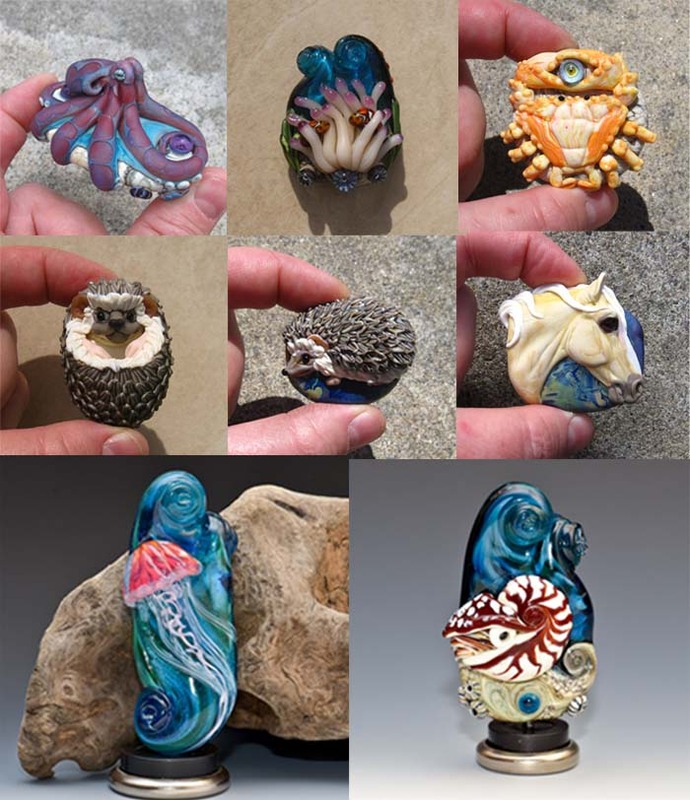 Three fabulous days that will span her famous sculptural beads featuring sea life (with that signature walking-twist, glass spin motif) and her so-fabulous horse and other land animals beads. (Hence the class name – Surf ‘n’ Turf.) 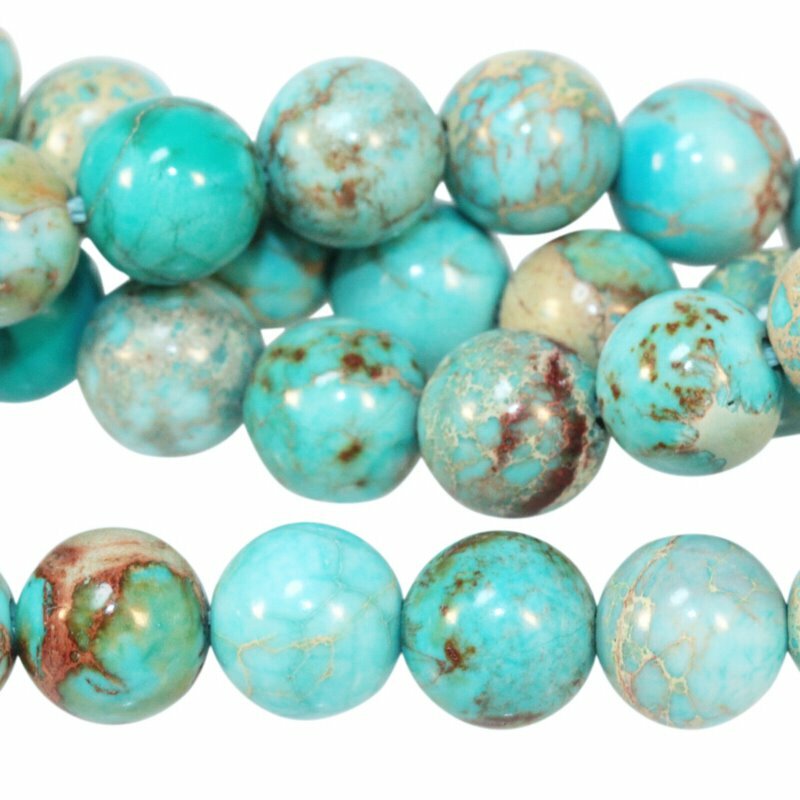 Don’t you want to know how to make beads like this? Our world tour of sales continues. We did the Czech Republic, Austria, and now … Japan! 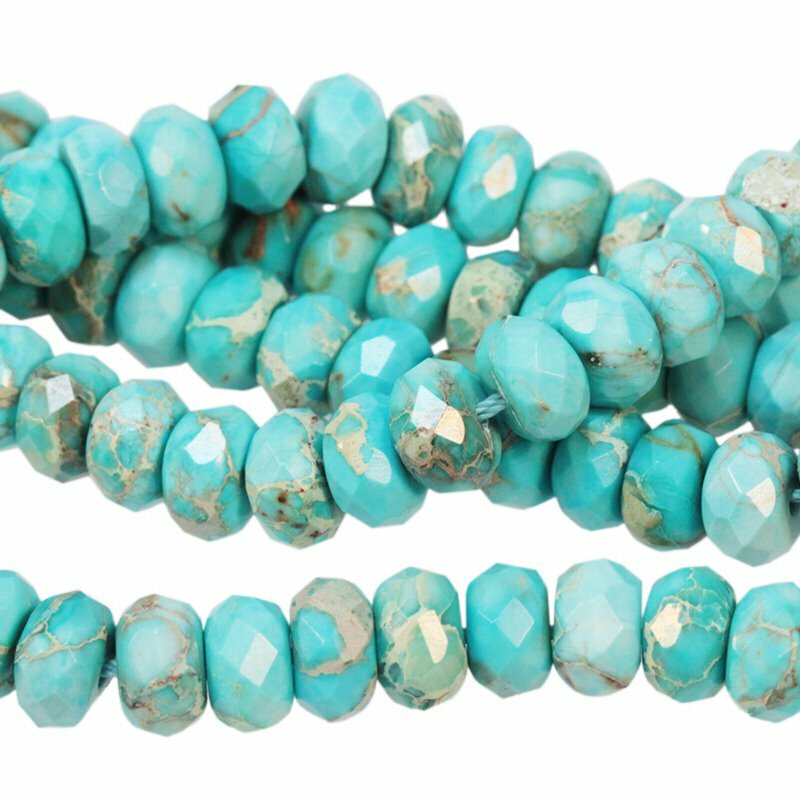 20% off Japanese Seedbeads and Stuff! – Miyuki, Toho, and Matsuno, oh myyy! Yes – the thread too. Get back to black! Sometimes the best accent is the one that disappears. Pair gunmetal grey or black metal findings with beads of bright colours and your dark clothing – the rich colours will seem to float on the dark background as the dark metal disappears. To help you try this out – savings of 20% or more off – from now until the spooky end of October! As always – you can view all interesting new stuff on the website here. September 2017 bead mat update: Freeform in all it’s glory!